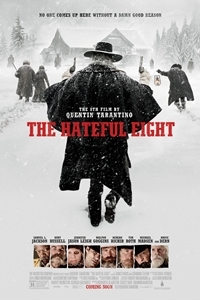 The Hateful Eight: So much hate, Tarantino needed double the film width to capture it all! No sooner was it announced that 100 theaters across America would be screening Ultra Panavision 70mm prints of Quentin Tarantino’s The Hateful Eight than images of a big hulking thingamajig from another era, lying dormant in the projection booth at La Mesa’s Reading Grossmont theater, began dancing through my head. Perhaps it would be a Merry Christmas, after all. A call to John Sittig was in order. No stranger to the San Diego movie scene, Sittig managed the old Center 3 Cinemas in Mission Valley and the pre–Landmark La Jolla Village before starting his 34-year run with Pacific Theatres Arclight, where he was eventually made head of projection for all of their theaters. His retirement in 2015 at age 65 lasted exactly three days, long enough to ponder his prospects and accept a similar position with Reading. Tarantino’s eighth feature is but the eleventh film to be lensed in the hopelessly arcane wide-ribbon format of 70mm. In addition to the expanded gauge, Ultra Panavision 70 used an anamorphic lens to give a slight squeeze that compressed the image an additional 1.25 times. That brought the aspect ratio to an ultra (they weren’t kidding) wide 2.76:1. Compare that to today’s 2.35:1 industry standard for widescreen projection, and you’re in for an eyeball-stretching experience. Grossmont isn’t the only theater in town to offer 70mm presentation — Mission Valley and Arclight have also made additions to their booths — but of the three venues, it’s the only one built specifically to house the format. Throw in a 60-foot screen, and I’m sure you’ll agree a trip to East County will be well worth the effort. Today, Ultra Panavision 70; tomorrow, horizontal VistaVision? Aw, who am I kidding? There is nothing Tarantino can do — or any other director for that matter — to bring back film. But for three glorious hours, we can return to a golden era of yesteryear, back to a time before 4K pushbutton Jumbotrons turned multiplexes into glorified living rooms, back when film projectionists actually earned their keep. Here’s hoping the film lives up to the format. Scott Marks: It’s great that Reading doesn’t throw out their old spares. Why was there a 70mm projector still taking up space in the Grossmont booth? John Sittig: We built the Grossmont three-plex in...I want to say 1983. In the early ’90s, we added on six screens. It was a 70mm auditorium from the time the theater opened in 1983. By that time, they were not photographing films in 70mm, but they were converting certain 35mm titles to 70mm to take advantage of six-channel stereophonic sound, which Dolby or 35mm magnetic prints did not have. They only had four tracks. It was used quite extensively until DTS and Dolby and SDDS all came out in ’92 and ’93 and pretty much eliminated the need for 70mm. The screens weren’t nearly as big as they were in the 1960s and with the availability of sic-channel digital sound, there was no longer a need for the wider-gauge format. SM: When did you receive the call from The Weinstein Company (TWC) asking that you lube up the dinosaur? JS: It goes back quite a way. Chapin Cutler, one of the founders of Boston Light and Sound, is the guy who searched for all the 70mm projectors to do this installation. He read somewhere that I had an Ultra Panavision lens. SM: Me, too. It’s in the garage next to the Zoetrope and Sensurround subwoofer. (Laughing.) Seriously, how does one come to be in possession of a 70mm Ultra Panavision lens? JS: When I was with Arclight, we would occasionally play something in Ultra Panavision — like the 40th anniversary of It’s a Mad, Mad, Mad, Mad World. So I acquired a lens of my own. Chapin called and asked to borrow it because they were doing tests. That’s when I first heard they were tentatively thinking of doing something. This was probably 15 months ago. Panavision only had a few Ultra Panavision lenses left. Chapin borrowed mine — he also had one of two of his own — and I’m guessing they used those to look at rushes. That’s when I first heard about it. Then I read on the internet that Tarantino was shooting The Hateful Eight in 70mm and wanted to have a semi-wide release of the film in that format. TWC contacted myself and every other exhibitor in the country, I guess, to ask if we had the equipment, and also if we had any interest in playing it. Being a film person — even though I knew it was going to be a heck of a lot easier to pop in a hard drive — I wanted to show 70mm. SM: You mentioned earlier that TWC did their best to make things easy on the booth op. Instead of being shipped on individual reels for projectionists to mount up, the print, all 240 pounds of it, will arrive on one giant spool, ready to be plattered. Who will be manning the booth? I assume it’s not going to be the concession staff. JS: I have trained several people, all of whom had 35mm experience when they worked for Reading. I’m going to be in the booth a good amount of the time to make sure nothing scratches the print. I would prefer not to show a scratched print. We have a part-time technician who is also a projectionist at the Reuben Fleet Space Center in Balboa Park, which of course runs horizontal 70mm. From what I understand, Reading has three theaters in New York that will be playing it in 70, and it’s been a challenge finding people who have real 70mm experience. For all practical purposes, the last 70mm release was Far and Away, so it’s been 25 years since the projector’s been used. SM: I was trying to remember the last film I saw projected in 70mm. Apart from the occasional one-off booking of Lawrence of Arabia or West Side Story, I think my last 70mm sighting was True Lies in 1994. The press screening of The Hateful Eight was on DCP, so I decided to wait. Have you seen any of the film? JS: We have a single test reel, part of a reject print, so we do have a little bit of the actual film. I have purposely tried not to see it because if I’m going to be in the booth for a week or two, I’ll have more than enough chances. SM: I understand the digital release will be different from the 70mm roadshow version. JS: Yes. It will be shorter than the 70mm print, and that’s not only counting the overture and the callback music. There are scenes in the 70mm version that will not be in the digital release. SM: I’m from Chicago, where the film will play the Music Box Theatre. They’re boasting about having to rent a larger, 40-foot screen for the run. Wow! Only 40 feet? They should see it on the big Grossmont 60-footer! When I put together my piece on San Diego’s 10 best movie theaters, I called a couple of the local IMAX houses in town, and no one would tell me the actual dimension of their screens. I’ve been to both the Mission Valley and Mira Mesa IMAX houses and neither look much bigger than the Grossmont. JS: I can’t say for sure, but Mira Mesa might be slightly bigger only because it was really an IMAX auditorium that they built from the ground up as opposed to what is commonly known as LieMAX. JS: It’s what they did at Mission Valley and at any hundreds of theaters across the country. The Grossmont screen is probably comparable to most of those, or maybe even a little bit bigger. Dec. 23, 2015 @ 12:27 p.m.
Tarantino make big bucks with fake "gun violence", yet make a big deal about his opinion that our Second Amendment rights should be infringed. I will continue my boycott of Tarantino and Hanoi Jane. Feb. 1, 2016 @ 11:48 a.m. Sounds like you still can't get the ride paddies out of your head. PS: wasn't aware that Jane Fonda was still a prolific screen actress.